Welcome back to the third in my new weekly series on the blog, Friday Finds. This is a look back through my wedding photography over the past few years, where I pick out images that show the way my documentary wedding photography can work on the day itself. It might be a chance to show off pictures that may be new to you, or ones you’ve seen before. But I thought it would be interesting to talk a little bit more about how they came to be and why I think they work so well. This picture was taken at The Running Horses pub in Mickleham, after Veronica and Dario had got married at Leatherhead Registry Office. This is, for me, a perfect example of documentary photography. 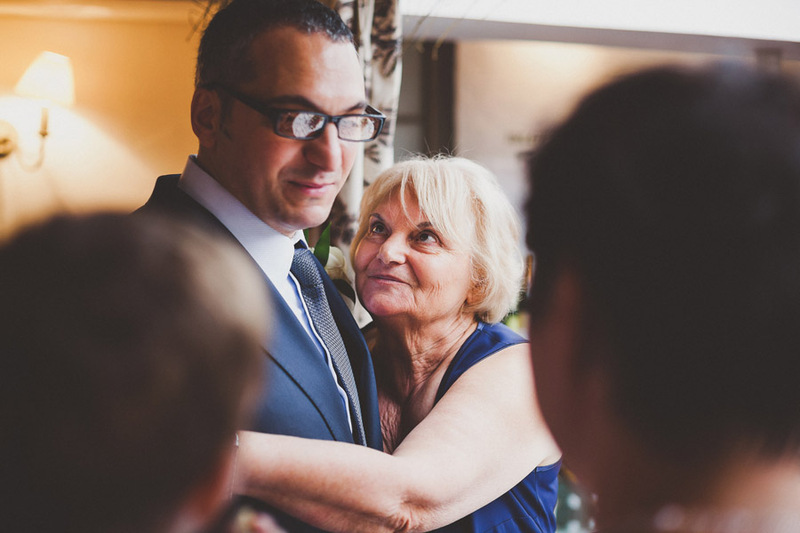 It’s a simple moment during the reception, where the groom has been hugged by his mother, and is now chatting to some friends, but the depth of feeling in her eyes and her lingering hug is clear to see. I can’t help but feel that the image perfectly encapsulates her love for him. Great expression here, way to go capturing it without intruding. I can totally picture the scene! Mom hugs son and wants the hug to last forever. Absolutely, that’s what called as mother’s love. Great capture Sam. These old eyes are really saying a lot. You can clearly see the love, affection, care in her eyes.